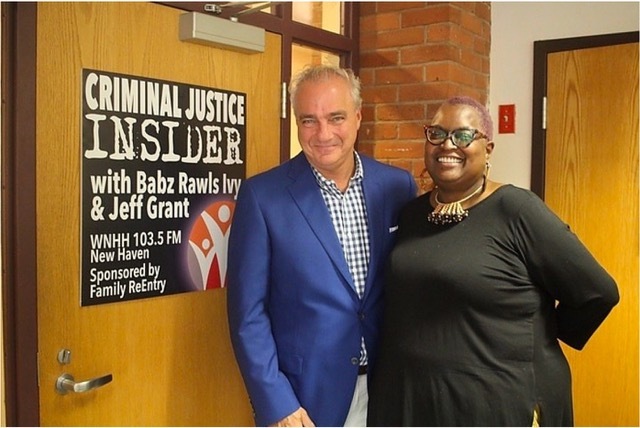 Join us on Criminal Justice Insider as Babz Rawls Ivy and Jeff Grant take things personally, First and Third Fridays at 9 am & rebroadcast at 5 pm on WNHH 103.5 FM New Haven, live-streaming on newhavenindependent.org. Call-in # (203) 872-7356‬. On Nov. 3rd CT State Legislator Robyn Porter was our guest. On Nov. 17th CT Commissioner of Correction Scott Semple was with us in the studio. On Dec. 1st we talked with SCSU Professor Amy Smoyer and NH WRWG Co-Chair Jackie Lucibello. On Dec. 15th we were joined by Lorenzo Jones, Co-Executive Director of the Katal Center for Health, Equity & Justice. On Jan. 5th our guest will be Danielle Cooper, Assistant Professor of Criminal Justice and the Interim Director of Research at the Tow Youth Justice Institute at the University of New Haven. On Jan. 19th we will be joined by Cynthia Farrar, Co-Founder of Purple States TV and the documentary, “Life on Parole.” Other upcoming guests include U.S. Senator Chris Murphy, , Carlah Esdaile-Bragg of Cornell Scott Hill Health, Flikshop CEO Marcus Bullock, Malta Justice Initiative Chairman John Santa, Andrew Clark Director of the Institute for Municipal and Regional Policy at CCSU, Christopher Llinas, Esq., and many more. Sponsored by Family ReEntry – Serving the Justice Community Since 1984™, and the Community Foundation of Greater New Haven. The airwaves are open to discuss Criminal Justice – from the Inside. A new show, Criminal Justice Insider, co-hosted by WNHH-FM’s Babz Rawls-Ivy and Family ReEntry’s Executive Director, Jeff Grant, takes a unique perspective on all issues of the justice system, including the effects of incarceration and the challenges faced by ex-offenders. personal background stories of the show’s co-hosts. Rawls-Ivy and Grant have both served prison sentences. As ex-offenders, they are well aware of the challenges, inside and outside, of the legal system and the prison system. They are also both examples of success and hope for others.